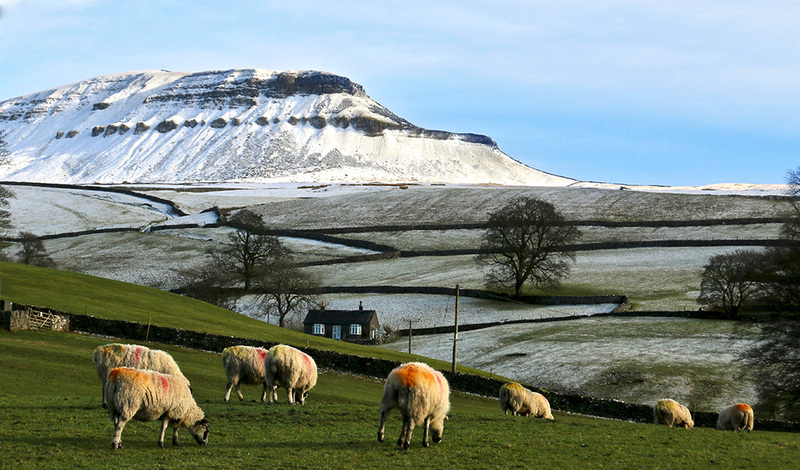 The Dales wrapped in a white winter coat – a rarer sight than it once was. I wonder if today’s youngest generation will one day be telling their grandchildren about the time they witnessed the final snowfall in the region. Climate change is definitely happening. ‘Experts’ might disagree over the causes, and certain trumped-up heads of state might be in denial over it, but I’ve seen it happening in my lifetime. That’s not just through misty reminiscences of harsh winters – such as in 1962/3 when as a child I recall enormous ice-slides and endless sledging – but also through my work. When editor of Countryman http://www.countrymanmagazine.co.uk/ I received hundreds of articles concerned with changes in animal behaviour, the disappearance of species, alterations to landscape, unusual flooding and strange seasonal variations etc. Left alone, Nature will take its course – the trouble is, humans are not always in line with Nature’s wider picture. I received hundreds of articles concerned with changes in animal behaviour, the disappearance of species, alterations to landscape, unusual flooding and strange seasonal variations etc. Left alone, Nature will take its course – the trouble is, humans are not always in line with Nature’s wider picture. This month’s photos show how different the weather has been over the last few weeks . One minute it’s green and warm, fooling spring flowers into poking through; the next minute the same plants are battling temperatures of -6C. 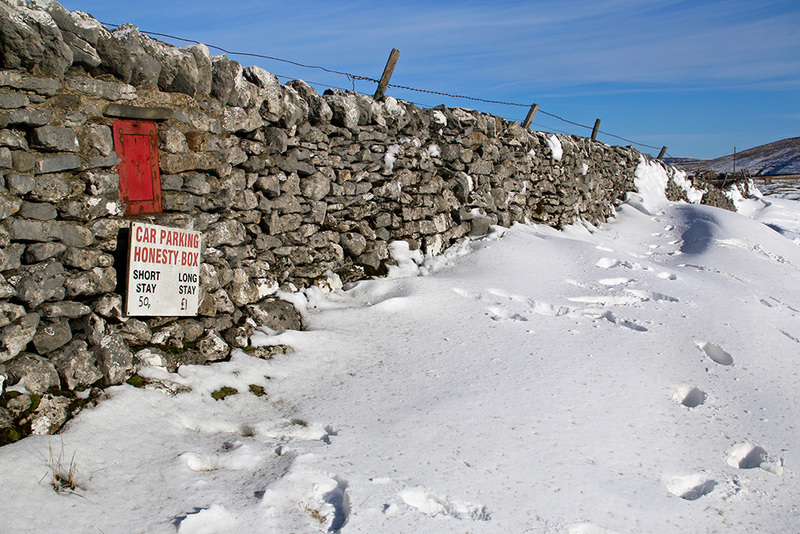 Seeing all the snow reminds me of some of the old Dales sayings I’ve come across over the years. Farmers up in Swaledale might say: “Snaw’s fair stourin’”, which means a strong wind is blowing snow strongly. If it is tewtlin’, it means the snow is falling gently and settling. In one of his many books, Bill Mitchell talks of farmers teeavin’ (wading) their way through snowdrifts to rescue sheep. Small 4x4s can help nowadays but hill-farming is still a very arduous job (with scant financial reward) when the Dales are in the grip of winter. Folk often ask me, ‘What does Penyghent mean?’. You’ll discover a few answers but really no one can be certain of its origin. It’s (probably) a name that’s been passed down from the days when Celtic tribes lived in the area. But as our language changed and different people moved in, translations were often corrupted or deliberately altered. Even in the last century thoughts on the name’s meaning have varied. Today we’re told it means ‘hill of the winds’, whereas in Victorian times it was translated as Pennigant (from Pen-y-Gaint), meaning ‘at the field head’ or ‘end of the plain’. Another Dales mystery. While the posse kept an eye out for the main event, I was looking the other way at the setting Sun. I see that several of my favourite areas of the Dales are featured in the list of Britain’s top 100 walks. Many of the 8,000 people who contributed to the list have walked in my footsteps. It’s good to see the promotion of a healthier lifestyle, and when it benefits local traders, accommodation providers and publicans etc, then so much the better. 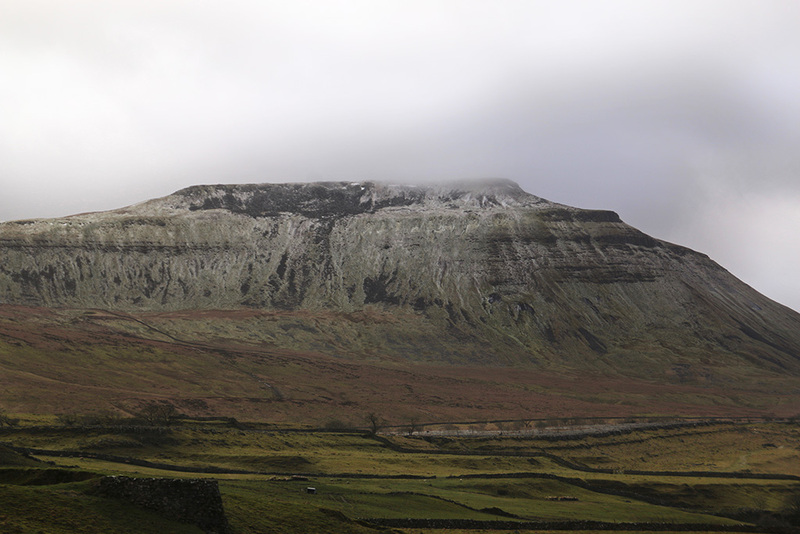 Earlier in the week Ingleborough looked like it had been ‘lime-washed’. The walk from Clapham up to Ingleborough summit features in the top 100 walks list – you wouldn’t have got me up there on this day for all the tea in Yorkshire. My small gripe about the list is that most of the walks are already popular and the publicity is likely to attract thousands more boots over those same paths. I wonder how many walkers (or TV programme makers for that matter) will be willing to pay for the upkeep of those over-used routes. 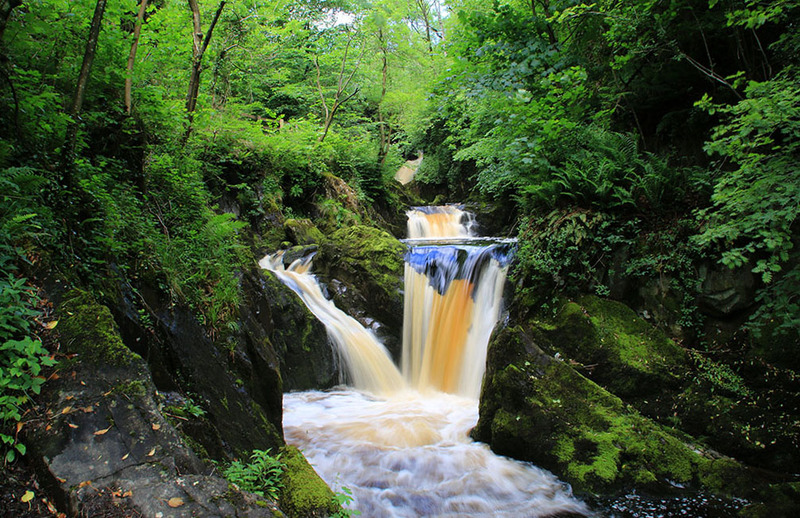 Another of the favourite walks is the Ingleton Falls route. Picture shows Pecca Falls. Before you have a go at me, I know that in a way my blog and other writing down the years has also contributed to attracting more tramping of the fells – I’m not being hypocritical, I have given (and still give) money towards path repairs and Mountain Rescue charities in the Dales. Since slipping on icy steps a few weeks ago and injuring my left hip and knee I’ve not done much strolling, so thank goodness I also have a car to get me around the dales. 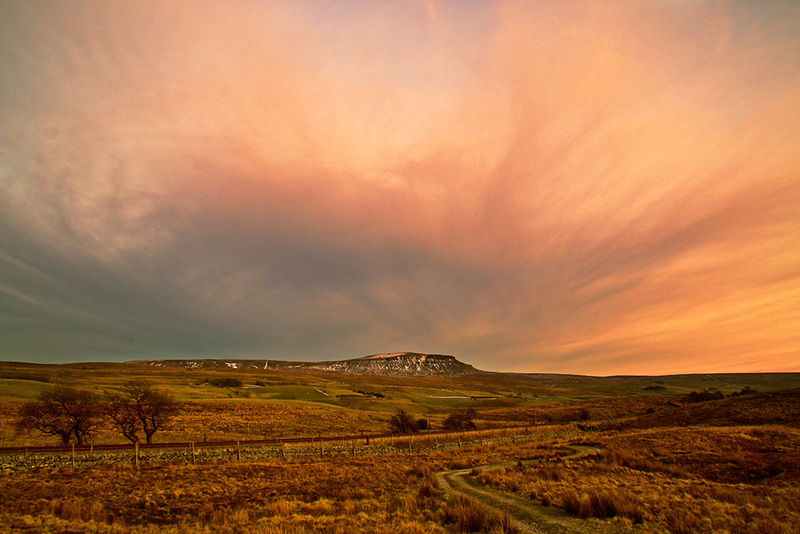 Top photo in the blog shows Penyghent from near Brackenbottom. 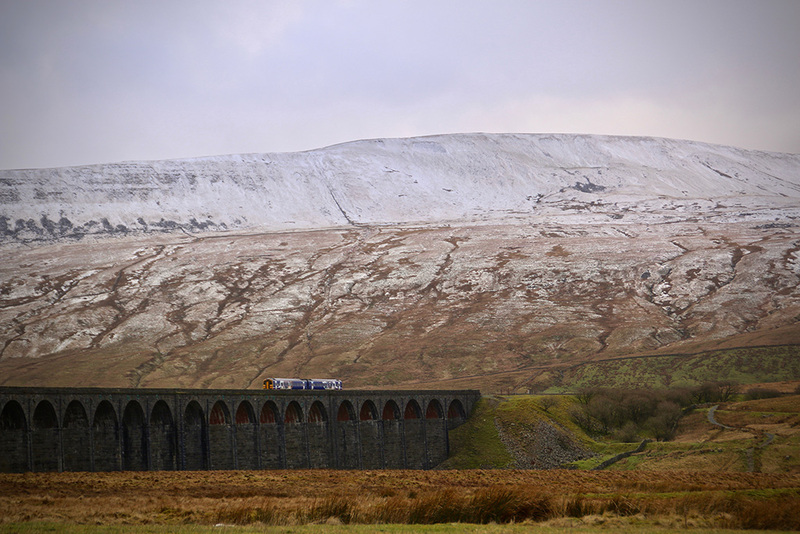 To complete the Three Peaks trio here’s a wintry looking Whernside and Ribblehead Viaduct. Looking from Horton-in-Ribblesdale across the quarry workings to Ingleborough. I’m saddened to hear this week of the death of the inspirational Hannah Hauxwell (91). I only met her briefly at some ceremony or other. 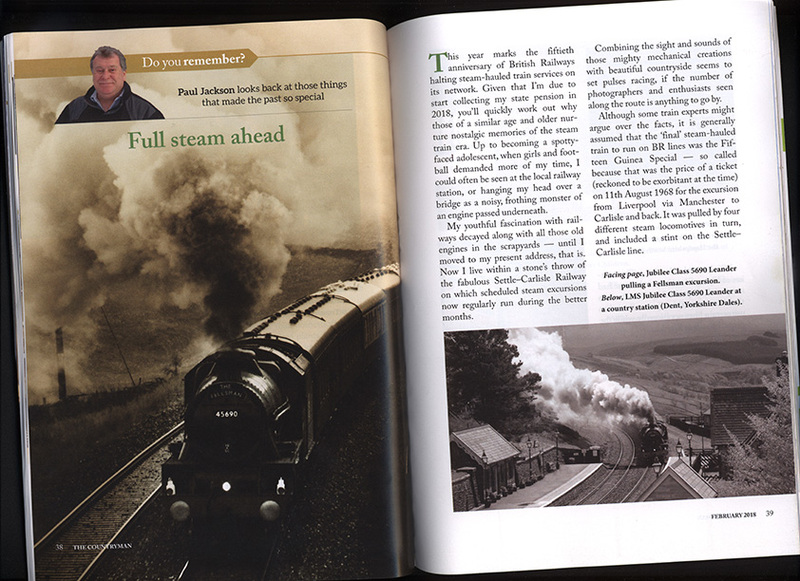 Being involved with Dalesman at the time I asked if she and her neighbours up in Baldersdale still considered themselves as Yorkshire folk (since the political boundary changes in 1974). Hannah replied firmly that they always thought of themselves as Yorkshire and felt no association with Durham. I hope everyone born on the south side of the Tees still thinks the same. Hannah was a lovely lady unspoilt by all the attention she received. 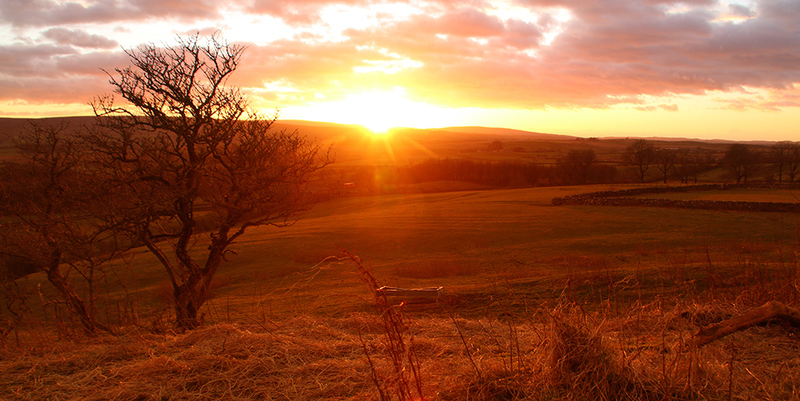 I watched the sun go down from the old back road between Clapham and Ingleton on Wednesday. 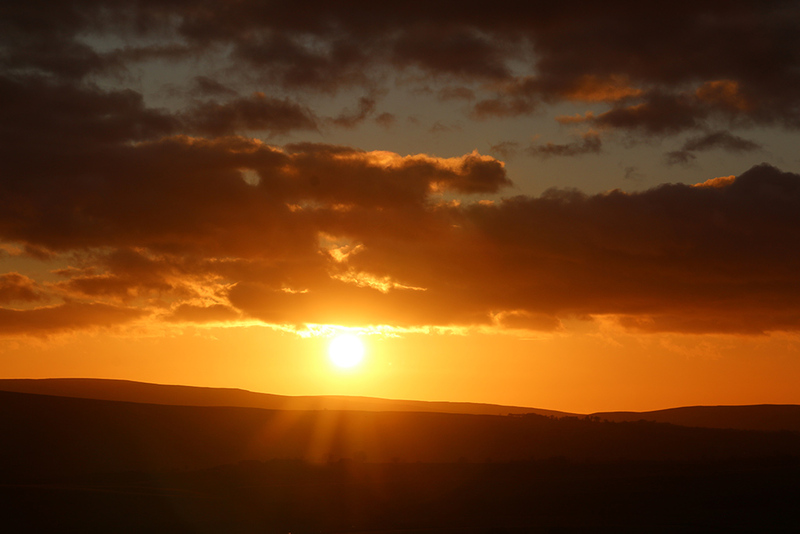 The golden glow belies the fact it was below freezing thanks to a strong westerly wind. Ever wonder how the good folk living by the Ribble reacted in the 1870s on being told that a railway was going to be built along their peaceful dale? Most ordinary residents probably thought they didn’t have a choice in the matter and just got on with their lives. Today we think and react differently – but in the end, as in the Victorian era, our protests will more often than not go ignored. Those with money and power will have their way, as it seems with the proposed High Speed 2 railway scheme. ‘HS2 has come to symbolise a country run against the interests of the many and in the interests of the few.’ That’s a great sentence, sadly not one of mine, written by Patrick Barkham. It sums up my feelings about yet another ill-conceived fantasy project from which London will be the biggest benefactor. Latest estimates predict it will cost £57 billion – yes, fifty-seven-billion pounds, let that sink in – to cut 32 minutes off the journey between Birmingham and London. Our Northern Powerhouse (falls about laughing at the shallow attempt being made to deliver that promise) will eventually link in with this project (price yet to be properly determined) and – whoopee! – uncouth Yorkshire oiks like me will be able to take out a mortgage for a ticket and get to the capital to improve my flagging social status, some 45 minutes quicker. To achieve this, thousands of square miles of beautiful English countryside will be destroyed, wildlife habitats torn up, homes demolished and many a village life wrecked. Meanwhile, we are being fed a load of bull about job creation and that this super highway will bring great benefits to the north – don’t believe a word of it. Shareholders and contractors will make sacksful of dosh, most jobs will be temporary with workers being paid minimum wage, and I have yet to read one single persuasive argument showing how the North will benefit as a region. I’ve visited the National Media Museum in Bradford dozens of times. I’ve taken children there, attended functions and exhibition openings. I’ve always been proud to have a ‘National’ museum on my doorstep. It even hosts the International Film Festival, promoting the city and Yorkshire further afield… well, it did, anyway. Museum officials have just announced they are abandoning the festival after 20 years and followed this by saying they were sending 400,000 unique photos from its impressive collection to be exhibited permanently in London. So the asset stripping of the museum is well under way. To be discussed is the renaming and streamlining of the museum. One suggestion involves relegating it from the premier division of ‘National’ to (Division One) ‘North’. Eventually, I see the title becoming ’Yorkshire’, then ‘Bradford’, followed by ‘a rear room of an independent camera shop in Idle’. Pardon the pun but there’s been a total loss of focus here. If we can afford to host top-class exhibitions and museums in London why can’t it be done in the north? What’s next to disappear down south – the National Railway Museum? Bad weather, extra freelance work and problems with contact points on a camera lens have conspired to curtail my own photography this week. So there are a few older photos included in this week’s blog. Make the most of them because I got a call from Boris Johnson who says he wants the best 20 per cent of them exclusively for visitors to look at in a trendy coffee house in the capital. 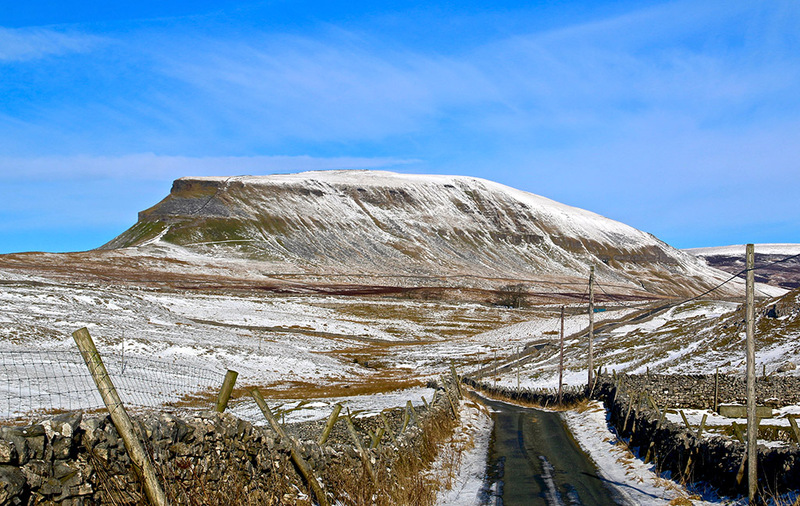 The top photo in the blog showing Penyghent was taken this time last year. The one above shows the hill from t’ other side just a couple of days later. On Tuesday a cleaner at BT pulled out a plug so the vac could be powered up (I could be wrong there) and the internet went kaput. So, despite the howling gale, I went for a walk. Sadly, the path through Castleberg Wood to the rock overlooking Settle was closed due to a fallen tree, a victim of the strong winds. I headed back to Langcliffe beside the Ribble via Giggleswick and Stackhouse. 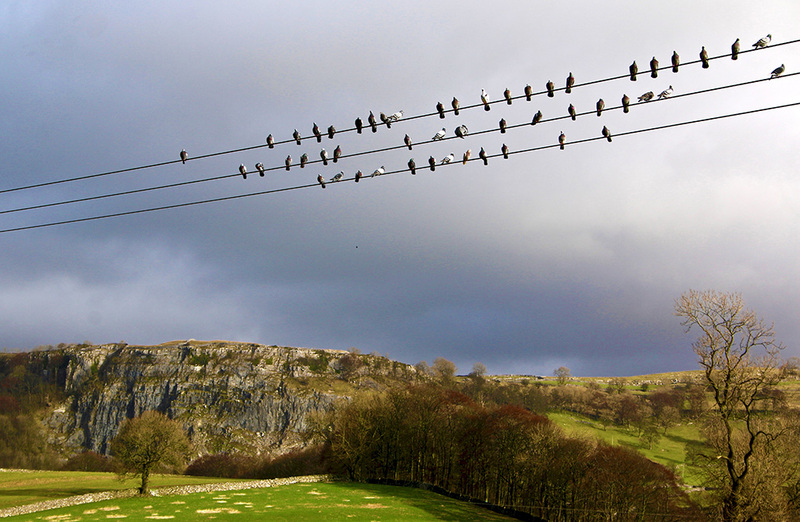 These perching pigeons caught my attention: a music score with Stainforth Scar, as a backdrop. The ground was decidedly sticky and further rain over the next three days won’t have improved the situation. The walls of the older cottages like mine are becoming saturated so let’s hope for a prolonged dry spell very soon. 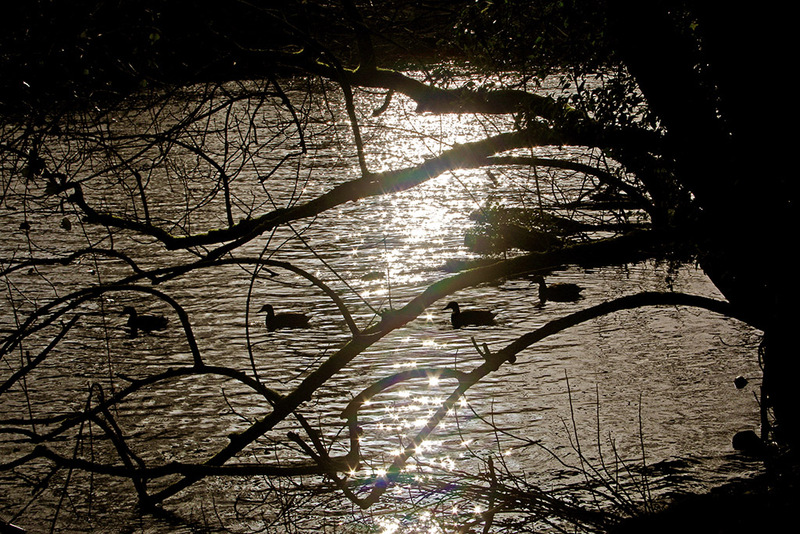 I snapped this one quickly at the mill pond in Langcliffe and was surprised it turned out virtually black-and-white. I’ve not tampered with the photo at all. 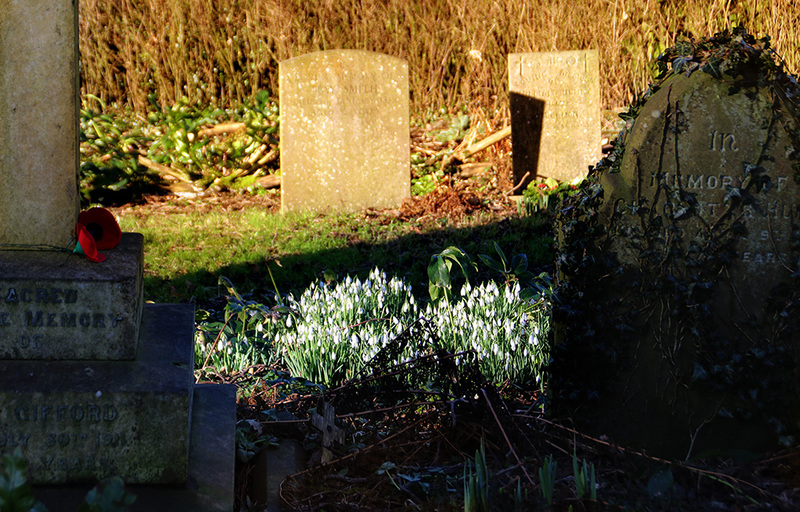 I do sometimes make adjustments to photos where I feel it is necessary – or just to amuse myself. Using Photoshop or other digital editors is no different from what used to happen in photographic darkrooms, yet for some reason viewers can get all hot and bothered by ‘touched-up’ photos. Some photographers are looking for an accurate representation of a subject; others want to add their own interpretation. Viewers can have an opinion on what’s been created but should remember that with ‘art’ there’s no right or wrong. That’s why we all have different artwork hung in our homes; why we decorate our walls differently or wear different styles and colours of clothes. The train spotting fraternity were out in force up and down the Ribble yesterday hoping for a glimpse of the revamped Flying Scotsman and the internet and Facebook groups are plastered with photos of the iconic engine. So where are all my piccies of this great event, you ask? Sorry, but on a Saturday I have to indulge in my own anorakic passion – watching Huddersfield Town. I admit to the addiction, and I know that each time I watch them it takes years off my life. If you have a cure please let me know. It ain’t my cup of meat. On a regular walk by the Ribble earlier this week I wondered what was different. I had a Bo Peep moment and realised that the sheep had gone – carted off to the abattoir no doubt. Just a few lucky ones remained in a distant field. I’ll miss them. Looking back at some of my photos of the lambs in those same fields earlier in the year, and thinking about their short lives, leaves me quite saddened. I’d be a useless farmer. From when I edited The Countryman magazine I recalled an article on the different styles of gates to be found around the British countryside – there are dozens of styles, many with their own names and peculiar to their region. 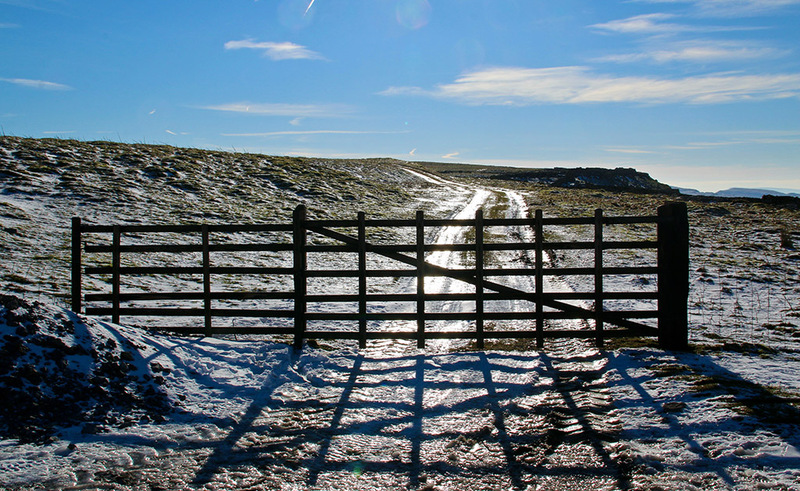 I’ve made a note to search through my collection of photos looking for the various styles that I’ve captured while wandering through the Dales… it’s certainly a job for the long winter nights, but for starters I took this shot of an old gate on the back road between Langcliffe and Settle this week. Is there a term for ‘gate collectors’? I’ve given up my car for a few weeks and left it, probably unwisely, in the hands of my son. It’ll be interesting to see how I go on without wheels. On Saturday I caught the train to Horton and called in at the village show. I’m sure this is the sheep that features on the Yorkshire Dales National Park signs. Back in Settle it was cracking the flags… the Flag Crackers of Craven were performing along with other traditional folk dancers (although one little girl wasn’t too keen on the loud drumming). With a free folk festival also on over the weekend this little town sure is a vibrant place to live. Here the 4th emergency service arrives in the nick of time to replenish stocks at the Lion. On Thursday, despite the grey cloud cover I had a very pleasant walk with friends, taking in the Hoffman Kiln at Langcliffe, up to Catrigg Force, Winskill and Victoria Cave above Settle. I’ve yet to get a cracking photo of these spectacular falls but I always enjoy my visits – and there was plenty of water in the beck to make this trip worthwhile. 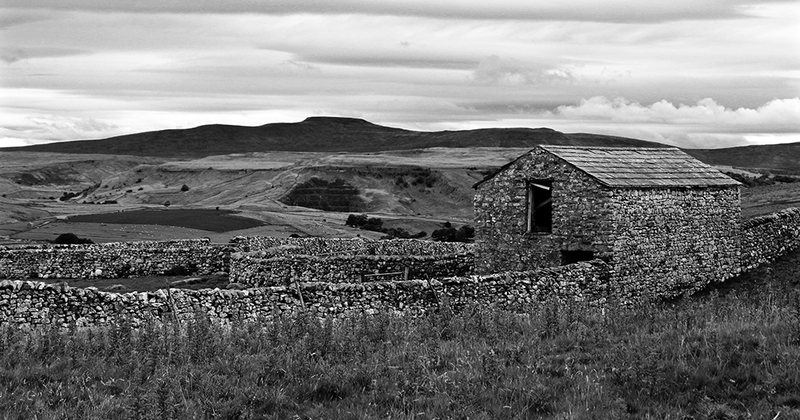 I also got this nice shot of farm buildings with Ingleborough in the background, which I felt would look good in black and white. Another day I wandered around Settle and saw this yellow ‘beck’. Sad old fool that I am, I still remember a pop song by Christie from 1970 called Yellow River, and I ended up singing the darn thing all the way round the rest of the walk. Finally, I came across these ducks on a pipe, looking as though they were about to start a proper duck race. A couple have not quite got the idea and are facing the wrong way. Quackers.